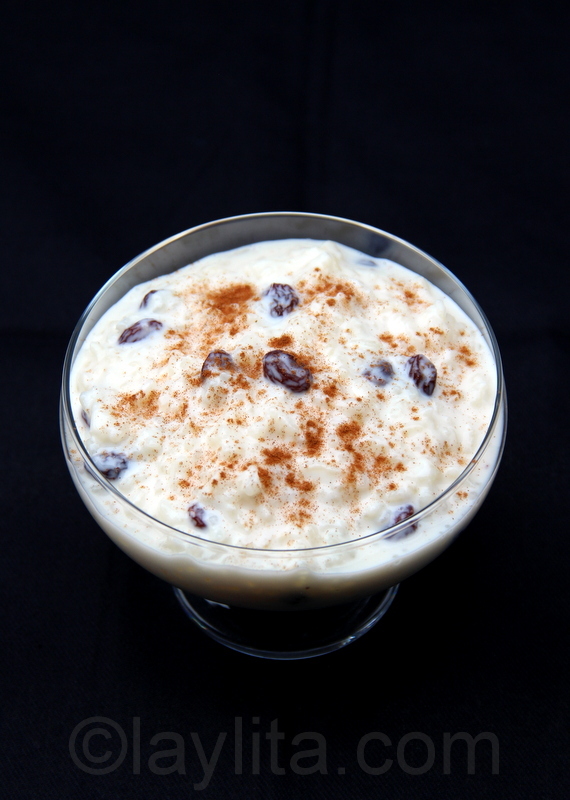 Arroz con leche rice pudding is a classic Latin American dessert made with rice, milk, cinnamon, sugar, raisins, and condensed milk. 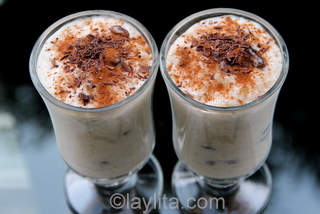 Obviously such a popular dessert has many recipe variations, and not just in Latin America, but it seems like this comforting dessert is well known throughout the entire world. I’ve had Asian variations that include spices like cardamom and rose water. 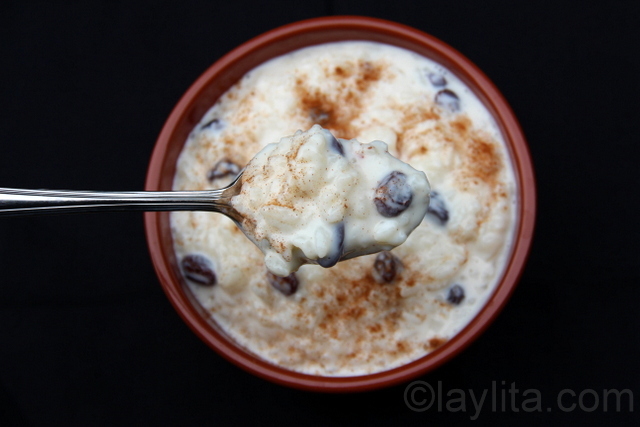 The Spanish arroz con leche recipe doesn’t usually have raisins or cinnamon, but uses citrus zest and orange blossom water. 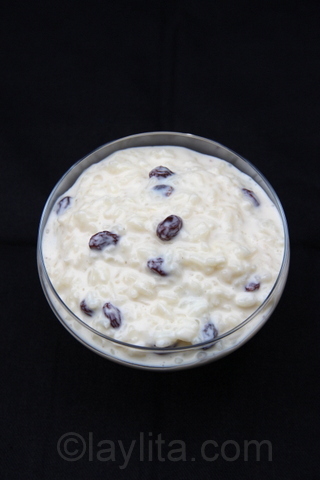 Other rice pudding variations include nuts such as walnuts, almonds or pistachios. 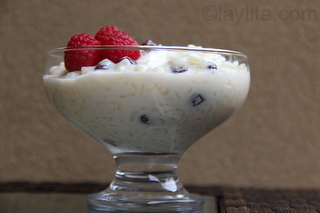 You can also make arroz con leche with coconut, berries, mango, apples, dulce de leche, chocolate, etc. 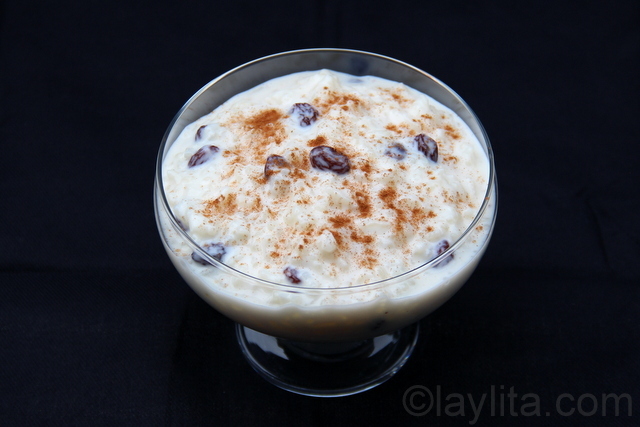 Arroz con leche is a great dessert because you can really customize the flavors to create a variation that is your own and that works for the different taste preferences of your family. 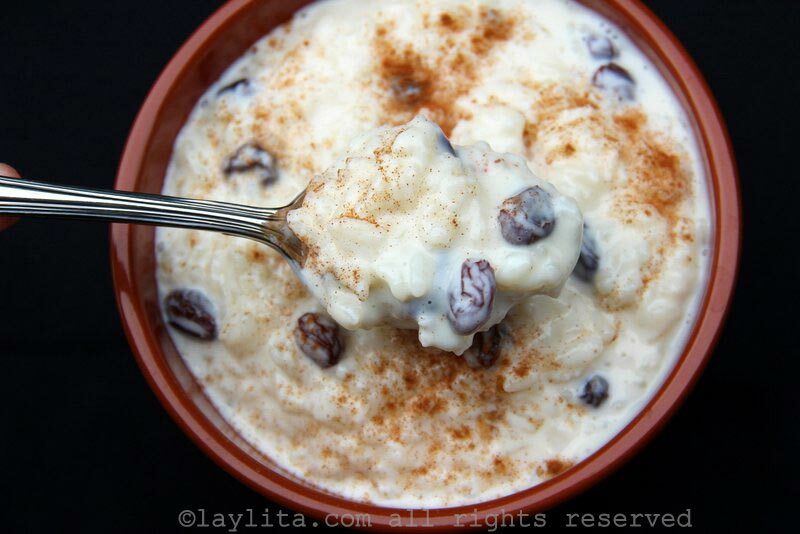 Easy recipe for homemade arroz con leche, a classic Latin American rice pudding dessert made with rice, milk, cinnamon, sugar, raisins, and condensed milk. 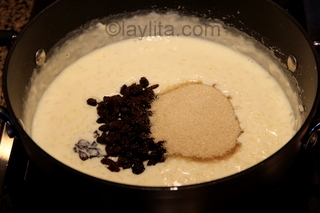 The preparation of arroz con leche also varies from one place to another, many people cook the rice separately in water (and sometimes spices) until it is tender (20-30 minutes), and then mix it with the milk and sugar. 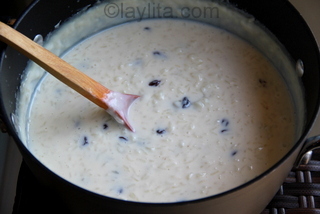 The best arroz con leches that I’ve tasted are the ones where the rice is cooked entirely in the milk, it does take longer for the rice to soften, but it’s completely worth the extra time. 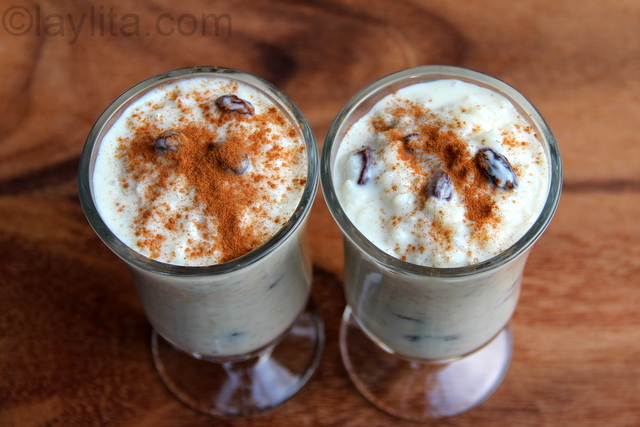 This also very similar to how we prepare morocho dulce, a spiced corn pudding drink, in Ecuador. 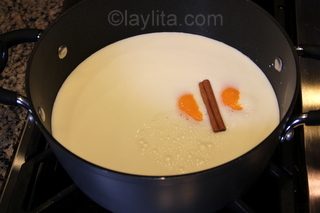 You can sweeten the rice pudding with sugar or with panela, if using the latter prepare a miel de panela or syrup first. 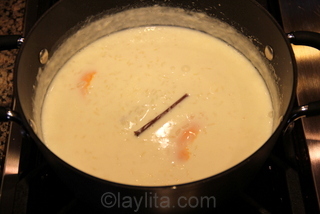 I also add some sweetened condensed milk at the end to give an extra richness; you can adjust how much condensed milk to use depending on how sweet you want it. 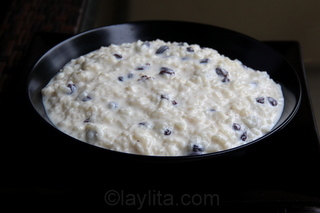 Arroz con leche or rice pudding is a must-have dessert for the traditional Ecuadorian Easter meal. 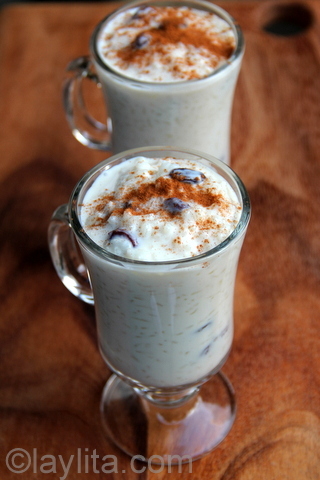 Arroz con leche can be served warm or cold. I tend to prefer it cold, except that when making it I can never resist having a small bowl right when it’s finished and still hot. 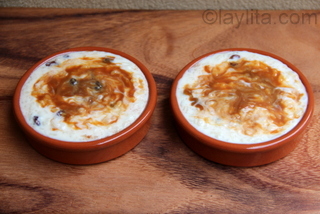 Another yummy way to eat it is with some warm dulce de leche on top – or top it dulce de leche and then put it under the broiler for a few minutes. 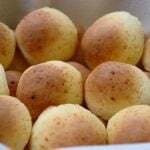 You can also put it in a large bowl and serve it family style, or for individual servings you can put in regular glasses, ice cream or dessert bowls, martini glasses, shot glasses (for small tasting size serving), ramekins, cazuelas, etc. You can serve this delicious dessert garnished with ground cinnamon, chocolate shavings, fresh berries, and/or dulce de leche, among others. 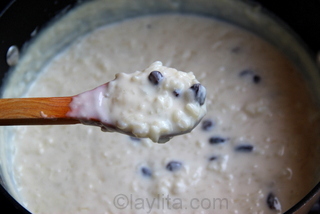 Making this wonderful recipe for the second time. Its on the stove right now and I can’t wait! Oh my gosh, this is nirvana! 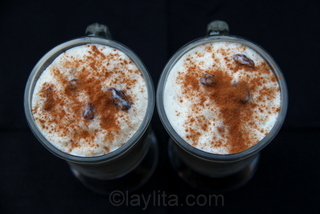 I made exactly as written by Laylita – used brown sugar, golden raisins, and Myers dark rum. I cannot wait to serve it tonight. 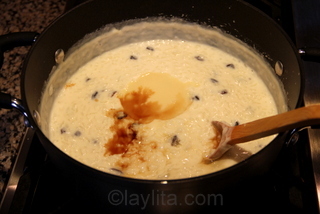 Doubled recipe and had to add a bit more milk while simmering. 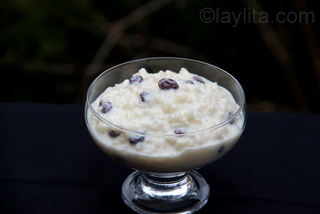 I used the slow cooker to prepare this delicious desert to go with my Christmas meal. I followed your recipe very closely keeping in mind that it would take longer to cook in the crock than on the stove. I set the pot on high and it took approximately 2 1/2 hours from beginning to end, stirring occasionally, only when I had to add the next set of ingredients. It was SO worth it as it was delicious and the pudding didn’t stick nor burned to the bottom of the pot! 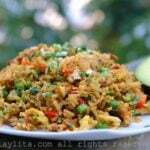 Is it required to use white rice? 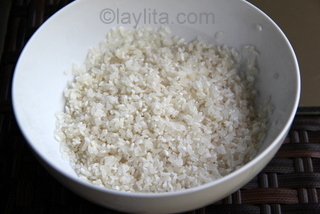 I am curious to try using short grain brown rice or basmati? I haven’t tried with brown rice, but it should work, though might take a little bit longer to cook. Quinoa is also a good alternative. Really good, but a lot of time and prep!